Leatherleaf Mahonia has an upright coarse textured growth habit. The foliage is held in horizontal planes on vertical stems and the leaves can be up to 1′ long. The leaflets are stiff , leathery, and a grayish or bluish green color above with an olive green underneath with spiny toothed edges. 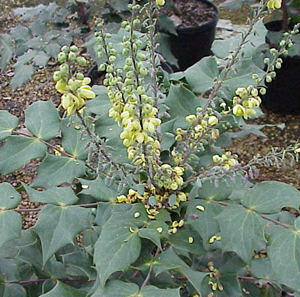 Mahonia bealei produces panicles of fragrant golden yellow flowers in the spring followed by grape-like cluster of blue black fruit. The fruit is actually more attractive than the flowers and is a source of food for wildlife. This shrub will perform best on a well drained acidic soil and is intolerant of poor drainage. It works well as a barrier shrub or specimen as it only grows 4-8 feet tall and and 4-5 feet wide.